A black-and-white image of a car painted on a large piece of plywood sits center stage. Surrounding it and rising up toward the rafters is a scaffold supporting more painted scenes on plywood squares. Visible in all these images are some of the more memorable features of UC Berkeley’s campus — Sather Gate, the columns of Sproul Hall, the trees lining Strawberry Creek, thousands of students carrying protest signs. They are scenes acted out in “FSM,” a play by Joan Holden with music and lyrics by Bruce Barthol and Daniel Savio. 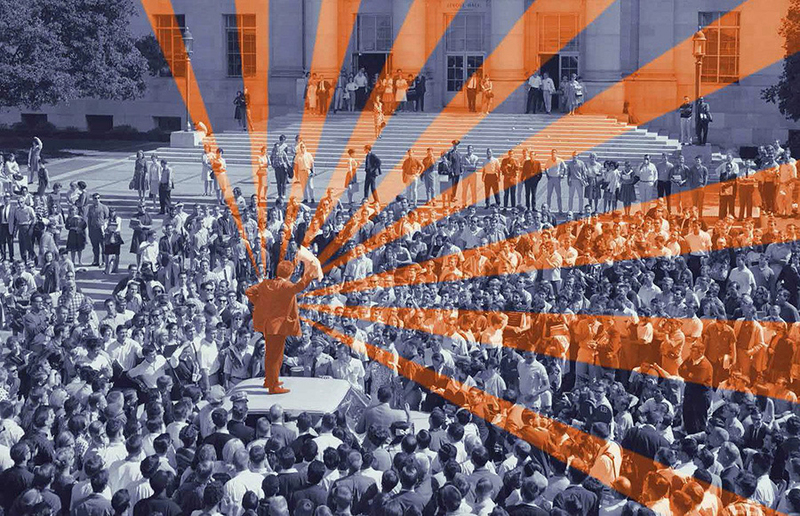 After three years in the making, the play made its world premiere in San Francisco in September as a spirited celebration of the 50th anniversary of UC Berkeley’s Free Speech Movement. “FSM” follows the historic student protest that consumed UC Berkeley’s campus from Oct. 1 to Dec. 8, 1964. The play begins with the event that sparked the Free Speech Movement’s creation: the arrest of a student speaking out on Sproul Plaza. From this moment, the play follows two parallel sets of experiences. The first is that of the students who fight to unite the student body and its leadership under the single goal of establishing true freedom of speech for all students on campus. The second is that of the campus administration, which is depicted as trying to restore peace and authority over the campus by subduing the voice of student protest. Despite the duality featured in most of the story, the truly exquisite moments in the production occur when FSM student leader, Mario Savio (Brady Morales-Woolery) and UC President Clark Kerr (Dan Hiatt) stand together on a podium in the middle of the darkened stage and reflect on the unfolding events. Without ever really speaking to one another, Savio and Kerr share their anxieties about making choices that will affect the lives of thousands students and workers. For Savio, these worries concern the next direction for the protest and how to best excite and encourage students to join the movement without forming fractures within. For Kerr, these scenes reveal the president’s balancing act in trying to please the general public and the UC Regents without creating more discord between students and faculty. These delicate, confessional scenes complicate the issues presented in the story as both characters reveal a genuine belief that their solution is best for everyone involved. The scenes further cast Savio and Kerr’s characters as grudging participants of the FSM rather than two of its main players, allowing for a brief but nuanced look into the people behind the public personas presented on television and in newspapers. Morales-Woolery in particular gave an exceptional performance throughout the show, capturing the magnetism and passion the real Savio exhibited in his speeches while also hinting at an inner discontent that arose from his position as spokesperson of a movement that was meant to give voices to not one, but all. Though the show’s main focus is on the 1964 events, it begins as an intergenerational dialogue in the present. The opening scene is a present-day panel discussion in a university history department. Fictional former FSM participants are seated on stage as interviewees, while younger characters — students attending the discussion — act as an audience calling out and challenging the actions and values held by the veteran activists. This scene doesn’t present a very favorable picture of the manners of modern UC Berkeley students, but it does call the audience to reconsider the story being told on stage and how should the strides made during the FSM protest should be considered and utilized decades later. Ultimately, the production encourages its audiences, and perhaps its student audiences more than others, to not only value the events of the past but also to consider what history it is they are writing today. “FSM” doesn’t answer this question, but it draws attention to the fact that there are many significant issues, such as accessibility to decent housing and immigration rights, plaguing the local community. Though these issues no longer seem to awaken in students the kinds of action and protest exhibited by their predecessors, the show’s makers suggest that they should. This play powerfully and effectively communicates with its audiences the influence that voices, especially young voices, have when they speak together. Even more importantly, though, it challenges current and future generations to take hold of the modes of protest available and utilize them to their fullest extent — to not just speak, but to ensure their words are heard.